Cucumber and mint in this sugar scrub recipe will help restore the skin on your face to its original glow. Cucumber has been long recognized for its soothing and anti-aging benefits for the skin thanks to its high water content, vitamin C, and other antioxidant and anti-inflammatory compounds. Mint, on the other, has antimicrobial properties capable of clearing up skin breakouts, while its menthol creates a cooling sensation on the skin, leaving your face feeling fresh and clean. Transfer the scrub into an air-tight container and store in the refrigerator. 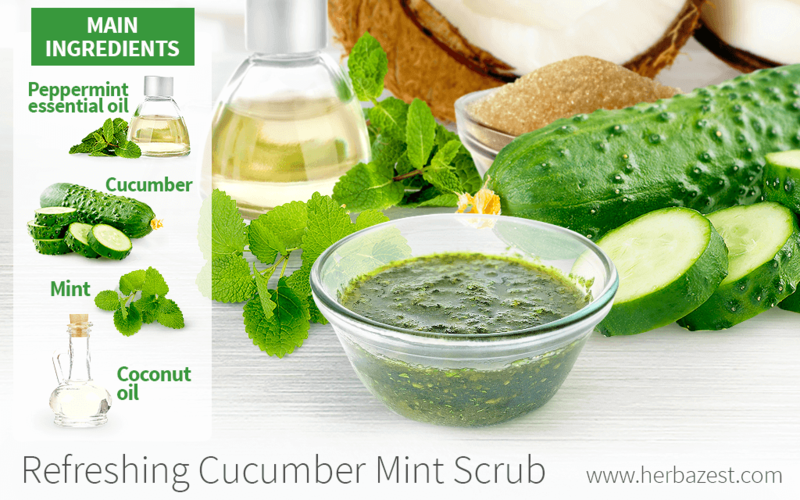 Apply this cucumber mint scrub to wet face while taking a shower or a bath. Gently rub it on the skin in a circular motion, leave for a few minutes, then rinse with warm water. You may also use it on the rest of your body. It is best to use it within a week.